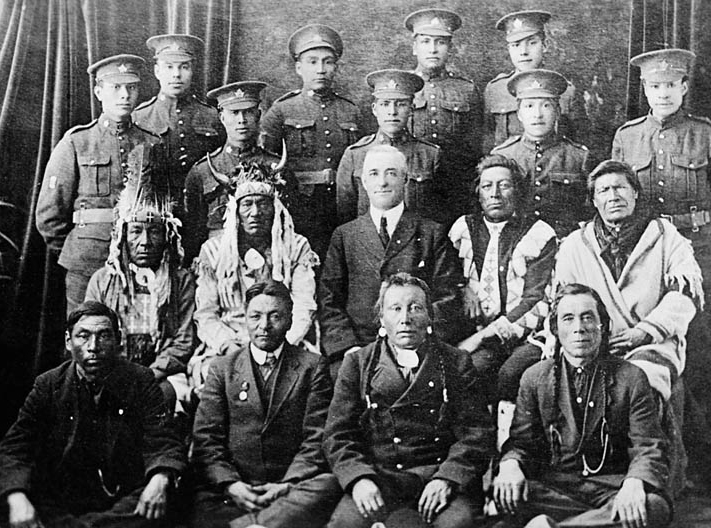 Elders and Indigenous soldiers in the uniform of the Canadian Expeditionary Force circa 1916-17. A Quebec-based amateur historian has set himself the ambitious goal of documenting every North American Indigenous soldier who has served since Europeans first discovered the continent in 1492. In his role as president of Association de recherche des anciens combattants amérindiens, Yann Castelnot of Riviere-du-loup has already compiled the names and histories of some 150,000 Indigenous Veterans of Canada and the United States into an online database. He began the work in 1998, inspired by an article on Indigenous soldiers of the First World War. “At the time, the Internet was not as developed as today and the subject of Native American Veterans was not addressed anywhere,” he recalled. Castelnot, who has lived in Canada for over a decade, grew up in the Vimy region of France and close to many other significant First World War sites, including the Somme in France and the Ypres region of Belgium, which fired his imagination. He noted that Indigenous North American soldiers served proudly and voluntarily. Castelnot started with names from the World Wars but soon expanded the project to all who had served after December 29, 1890 – the date of the Wounded Knee massacre, when United States government troops killed Sioux tribe members in South Dakota. The number of fatalities is disputed but some sources cite as many as 300, many of them women and children. He has received a number of honours for the work, including the Queen’s Diamond Jubilee Medal presented by the Governor General in 2013, which he said provided the inspiration to start digging all the way back to 1492. Governor General Julie Payette honoured Castelnot with a Caring Canadian Award in 2017 – the same year he received a Minster of Veterans Affairs Commendation. Many Canadians are familiar with Company Sergeant Major Francis Pegahmagabow and Sergeant Tommy Prince. CSM Pegahmagabow was one of only 38 Canadians to receive the Military Medal with two bars for service in the First World War. Sgt Prince was awarded a total of 11 medals for his service in the Second World War and the Korean War. Castelnot has offered the following names when asked for other notable Indigenous Canadian Veterans that Canadians ought to know just as well. A Mi’kmaq member of the Gesgapegiag First Nation, Sgt Jérome was one of the few Canadians to receive the Military Medal three times for service in the First World War. He was additionally named an Officer of the Order of the Black Star, a Polish order, for his distinguished service at a training camp at Niagara-on-the-Lake, Ontario where many Polish soldiers trained. Capt Smith later became chief of the Six Nations Grand River Reserve, near Brantford, Ontario. MCpl Giesebrecht, a medic with 1 Canadian Field Hospital, was killed in action in June 2010 during her second tour in Afghanistan. A member of the Mohawks of the Bay of Quinte, she received a posthumous Sacrifice Medal as well as the South-West Asia Service Medal. Sgt (Retired) Lafontaine is a Métis Veteran of peacekeeping operations in Cyprus and former Yugoslavia. He dealt with Post-Traumatic Stress Disorder after retiring from the Armed Forces in 2003 and has continued to advocate for other ill and injured Veterans. He has been recognized for this work with commendations from the Minister of Veterans Affairs and the Veterans Ombudsman.